Mark it 12-13 mph, Dude. You’re entering a world of foam. Well done, FWRHS and NS. Nickel Plate 765 begins its Norfolk Southern employee excursion itinerary today, and the crew have installed a GPS tracker for you to follow along. They’ve also kindly given SteamCentral access to the GPS output, and we’ve integrated 765’s last reported position into our NS Steam map. The map should also work on your smartphone, so bookmark it for when you’re out enjoying 765’s journey. Nickel Plate 765 is on a test run to Muncie, IN, today. Follow its progress on Twitter @nickelplate765. Remember that little five city tour the Fort Wayne Railroad Historical Society announced as part of the celebration of the 30th anniversary of the Norfolk Southern merger? Well, we’ve got some good news . . . and some bad news. The bad news is, it looks like 765 won’t be going to Muncie or Elkhart after all. The good news is, 765 will be going to Harrisburg, PA, Williamson, WV, and St. Louis instead. to make these excursions memorable, fun, and of course, safe. The last steam over Horseshoe Curve was rather inauspicious – a downhill, towed-by-diesels deadhead of Reading 2102 on its way to the Blue Mountain & Reading in 1985. The last operating steam was 2102 and Grand Trunk 4070 in 1977. 765’s stablemate 759 made a pair of trips between Harrisburg and Gallitzin in September, 1970. 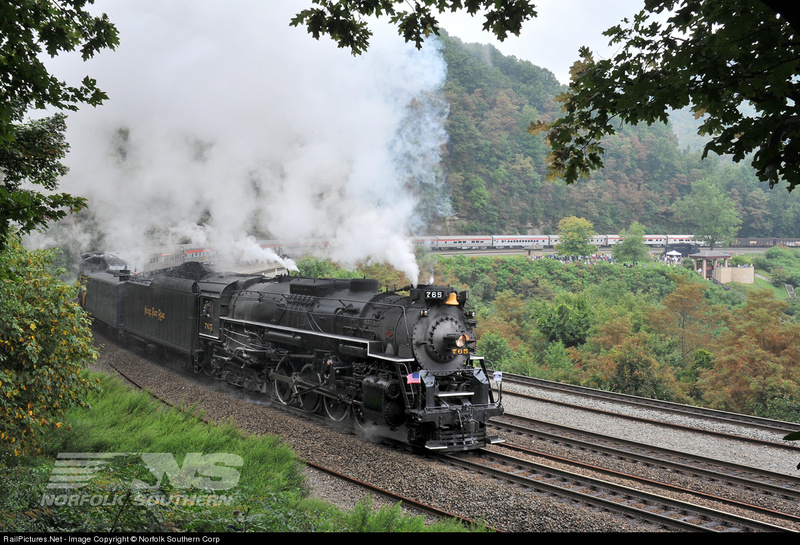 Before it tackles Horseshoe Curve, 765 will return to a familiar route (the former N&W between Columbus, OH and Portsmouth), then traverse the Tug Fork extension to Williamson, WV. Since these are employee trips and deadheads, detailed schedules may not be available, but we’ll post any schedule information made public by NS, FWRHS or TVRM in the Schedules. According to Rich Melvin, NS 8100 (the NKP heritage unit), will be in the consist on deadhead moves, but we understand that weekend excursions will be steam only. Congratulations to Norfolk Southern, the Fort Wayne Railroad Historical Society, and TVRM. This is 765’s biggest year since 1993, and it’s a smart move by Norfolk Southern to take advantage of a true “Heritage locomotive.” We sincerely hope the partnership prospers.